Two weeks ago, at a meeting of your Board of Trustees, shortly after Bill’s passing, there was a rather lively discussion about a matter involving the whole fellowship. When it had reached a certain level of intensity, I found myself waiting to hear Bill speak up, as he so often did and say those few words that would put everything in perspective. But he didn’t speak. And it was then that I realized way down deep that we would never hear his voice again…that we could no longer count on the constant presence of his wisdom and strength. We could never again say as we had said to many times before, “Bill, what do you think?” And I at least, have not yet come to accept this completely. Bill was no saint. He was an alcoholic and a man of stubborn will and purpose. How else could he have lived through the years of frustration, failure, and discouragement while the steps, the traditions, and the conference were being hammered out on the anvil of hard experience with the first few groups? That he had the self-honesty, the clarity of vision to see the vital necessity for the Third Step, and turning one’s life and will over to a Higher Power is just one part of our great good fortune that Bill lived. I have seen Bill’s pride and I have seen his humility. And I have been present when people from far countries have met him for the first time and started to cry. And all Bill – that shy Vermonter – could do was stand there and look like he wanted to run from the room. No, Bill was no saint, although many of us wanted to make him into one. Knowing this, he was insistent that legends about him be kept to a minimum – that accurate records be kept so that future generations would know him as a man. He was a very human person — to me an exceptionally human person. 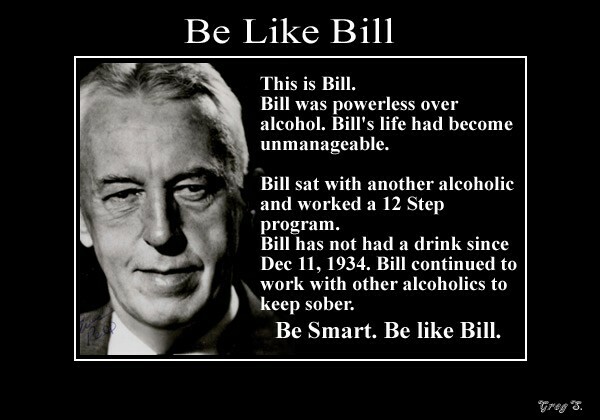 Bill’s constant concern during almost all of the years that I knew him was that Alcoholics Anonymous should always be available for the suffering alcoholic — that the mistakes that led to the fading of previous movements to help alcoholics should be avoided. To me one measure of his greatness is the clarity of his vision of the future in his determination to let go of us long before we were willing to let go of him. Bill was a good sponsor – the wise old timer determined to relinquish the role of founder because he knew that A.A. must, as he would say, come of age and take complete responsibility for itself. He had an abiding faith that our Fellowship not only could, but should run without him. Repeatedly, during the last few years, he has said in General Service Conference sessions “We have nothing to fear.” Bill believed that the wisdom of A.A. came out of church basements and not from the pulpit; that it was directed from the groups to the Trustees rather than the other way around. He sometimes felt, though, when the Conference disagreed with him as it sometimes did, that its conscience needed to be better informed, but it was this way that we really shared experience and developed strength and confidence that the answers would work out. Bill knew that it was not one voice that should be heard, but many thousands of voices. And it was his gift that he was able to listen to them all, then, out of the noise and confusion discern the group conscience. Than he would put it all together, the tension of argument would fade, and everyone would realize that his answer was right. What Bill’s death means to me now is, that all of us — all of us: you, the delegates, the Trustees — will have to listen much more carefully than we once did in order to make out the voice of the group conscience. And I know that this is possible. Bill has trained us for it beginning in St. Louis in 1955. 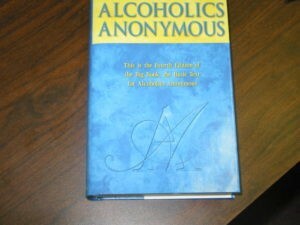 For this was Bill’s vision — to create a channel of communication within the Fellowship of Alcoholics Anonymous that would make it possible for everyone to be heard: from the individual through the group, to the delegates and to the Trustees, so that A.A. will always be here to extend a hand to the drunk who is at this very moment crying out in the darkness of his night as he reaches for help. In closing, I want to say that it has been an honor for me to have had this opportunity to participate with you in giving thanks to God that Bill lived and was given the wisdom and strength and courage to make the world a better place for all of us. There are many more things I could say, but what can one say finally of a man’s goodness and greatness? How many ways can you take his measure? I cannot do it or say it for any of you — only for myself. He as the greatest and wisest man I ever knew. Above everything, he was a man. And I believe that he left his goodness and greatness and wisdom with us, for any of us to take in what measure we can. May God grant us the wisdom and strength to keep Alcoholics anonymous alive, vital, attractive, unencumbered by the egocentricities that can so easily spoil it.